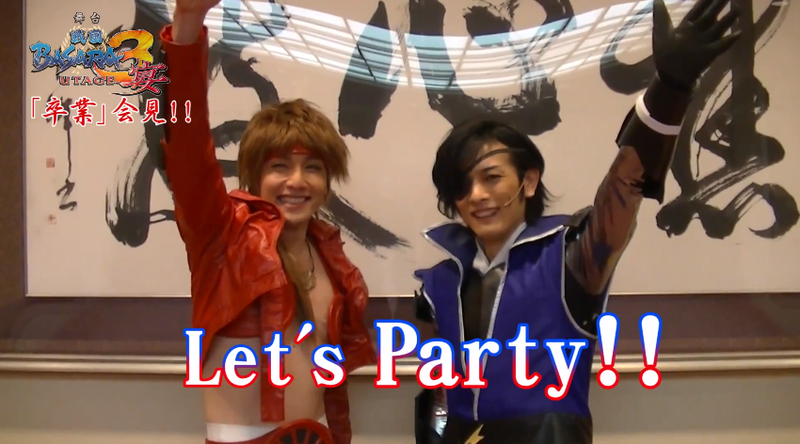 Basara Matsuri and the announcement of Sengoku Basara 4 seem to have caused the pace of news updates to increase lately. There's no news about next year's new game in this post, however there are some important updates for fans of the Butai Sengoku Basara stage plays and a few other tidbits. The biggest shock today was the announcement that Kubota Yuuki, the actor who has played Date Masamune in all six of the Butai Sengoku Basara stage plays to date, and Hosogai Kei, who has played Sanada Yukimura in all but the very first show, will be leaving the cast after the upcoming Butai Sengoku Basara 3 Utage finishes its run. I don't think anyone was expecting this news, which broke suddenly on the official website today. Both Kubota (in his usual abrupt style) and Hosogai have posted formal statements on the site along with a short video, where they explain that their final appearances as cast members will be in the next stage play between April and May this year. At least they'll both be present at July's Busho Matsuri event so the fans can say goodbye properly. Kubota doesn't look exactly like Masamune but he has always had the perfect attitude to play the part; he made the battle scenes terrifically exciting to watch. Hosogai was also a great Yukimura, with a warm personality to match his good looks and a readiness to throw himself to the ground to worship Oyakata-sama whenever needed. It's going to be strange seeing the plays continue without the two of them in future. The tickets for the newest stage play have been selling briskly; all of the tickets for the Osaka performances have sold out already almost two months before the scheduled dates. To accommodate all of the fans who want to be able to see the show, the organisers have announced their usual 'live viewing' event will be taking place in 25 cinemas across Japan on the 26th May 2013, the day of the play's grand finale. Tickets for the live viewing are limited so fan club members will be offered the chance to buy them first. The staff often make some kind of interesting announcement on the final day of each stage play run. I'm guessing that this time, though, they're going to concentrate on giving Kubota and Hosogai the send-off they deserve. Last but not least, a few sites have begun listing the first issue of Sengoku Basara Magazine, due for release in three weeks. So far I've only spotted it on Amazon Japan and e-Capcom (where it's strangely marked as unavailable at the moment); no doubt AmiAmi, Yesasia and CD Japan will all be carrying it in due course. I hope the magazine does well so I'll be ordering my copy as soon as possible!